If you’re the type of person that privacy and island living sounds like the ideal life for you, then come take a look at our Bald Head Island condos and just imagine living here. As the southernmost island in North Carolinas cape islands, this private island community encompasses a total of 12,000 acres and is accessible only by a 20 minute ferry ride from Southport, North Carolina. Here, beautiful homes overlook the beaches, water and salt marshes that make up the island landscape. Homeowners and their guests travel by electric golf carts and bicycles by paved and unpaved paths. Guests can rent carts by the day while visiting the island. Graced by miles of white sandy beaches, a championship golf course, 2 club houses, state of the art fitness center, tennis courts, swimming pools, a full-service marina, an immense network of walking and cycling paths winding through the island, and a wide assortment of stores and restaurants makes living here in Bald Head Island condos all you could hope for. Tennis players will love the four soft-surface tennis courts on Bald Head Island. The clubhouse has exercise rooms, locker rooms, and a resort style swimming pool. There is also a second swimming facility at the Shoals Club that has a lap pool and kiddie pool. The 10-acre harbor and marina has boat slips from 30 to 100 feet in length. 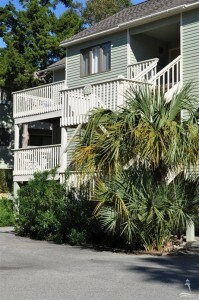 From the marina, homeowners have access to the Cape Fear River and the Atlantic Ocean. At Bald Head Island you can enjoy both casual and fine dining. You can also purchase groceries from the fully stocked grocery store located on the island as well.